We love natural, wholesome food as much as you do. We truly care about our customers and their health, which is why we are constantly striving to get the freshest, best produce possible. Our chef is trained by the prestigious Natural Gourmet Cookery School in New York City, NY! We use only organic, wholesome products to create our healthy meals. In order to continue the tradition of nutritional food, we’ve created cooking classes, to teach you our tips and tricks. Chef Soraia and the Natural Valley Kitchen staff have been providing food and catering services to my family for many years. The team has catered for many of our social gatherings and have provided us with healthy and distinctive choices that are lauded by all. Always timely, courteous and professional, the whole team at Natural Valley Kitchen is a pleasure to work with. Their food is always delicious, wholesome and pleasing to the eyes and the palates across a span of many age groups. Chef Soraia’s meticulous attention to detail combined with the quality of the ingredients used, comforts me. I know that with the Natural Valley Kitchen team in the house, the management of my party affords me the opportunity to be a guest and to have fun while ensuring that I’m providing a well balanced, high quality menu to my family and friends. I have recommended Chef Soraia and her team at Natural Valley Kitchen many times to my neighbors, to my family and friends who have not been to my events and I will continue to tout the innovative recipes of farm to table fare offered by Chef Soraia and the Natural Valley Kitchen to those who want to provide healthy meals to their loved ones and most importantly to those who want to relax enjoy their own events. We have catered many parties from Natural Valley Kitchen. They have exceptional service with excellent value. It’s truly great food that is artistically presented. Thank you Soraia! Soraia Haberli has been catering small intimate dinners, large celebratory parties, and special holiday gatherings for my family for years. You can find no better chef to plan, prepare, and cater a festive gathering. Having Soraia take over your kitchen is an amazing thing to behold — a true event! Guests love the Natural Valley Kitchen food, I love the simplicity of letting Soraia plan the entire event, and my wife loves the healthy menu selection! I have been lucky enough to have had many dinners at the home of the chef of Natural Valley Kitchens, Chef Haberli. What delight: the food is always delicious, well seasoned, and inspired! She can create anything from main courses to desserts! I look forward to her bringing her talents to Natural Valley Kitchens for all to sample! Soraia always delivers. You can rest assured that her dishes are not only fresh, delicious, and beautifully prepared, but her food is also healthy for your body! She knows how to cook with flare and creativity as well as keep her pulse on the latest foods that nourish your body and soul. Soraia is on the cutting edge of cooking for the health minded without compromise of taste and beauty! I am a very health conscious eater which is why I connected with this chef in the first place! My two favorite speciality items she prepares are her bean burger and her veggie burger. They are exceptional. Both are light but full of protein and truly keep your energy levels high. I recommend these for parties, prepared in advance! I have been enjoying Chef Haberli’s food for over three years. Her flavors are diverse but consistent with Natural Valleys healthy, organic focus. Every single thing I eat from her taste fresh. It is clear in her dishes her knowledge for organic foods is vast and studied. Everything she puts together tastes delicious and is well balanced. I adore her cooking! I have been to several parties that have been hosted by Soraia. Her tables are always set elegantly and beautifully. They vary according to the season and occasion. She is able to add her special flair to any event from the most casual to the most elegant. Her food is absolutely amazing. She would be able to accommodate any palate or dietary choice. Soraia takes great pride in her work and her skill and her talent are evident in every dish she makes. I have thoroughly enjoyed the parties that I have attended at her house. I would recommend her without any reservation for any catering event. Her experience and expertise would ensure that it would be a great success. 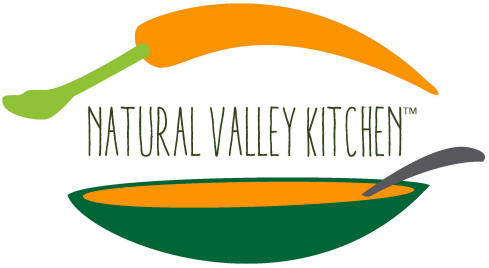 Natural Valley Kitchen is a premier food company focused on providing the highest level of wholesome, nutritious, and tasty products -- all designed to fit into today’s healthy lifestyle movement. Callicoon, NY – Farmer’s Market- Sun. from 11am-2pm.